Work continues on my table for the next engagement at Arnhem. Here is the basic layout on a grid of 11 x 9 hexagons on a 4ft x 3ft board. There is a lot of built-up area here. 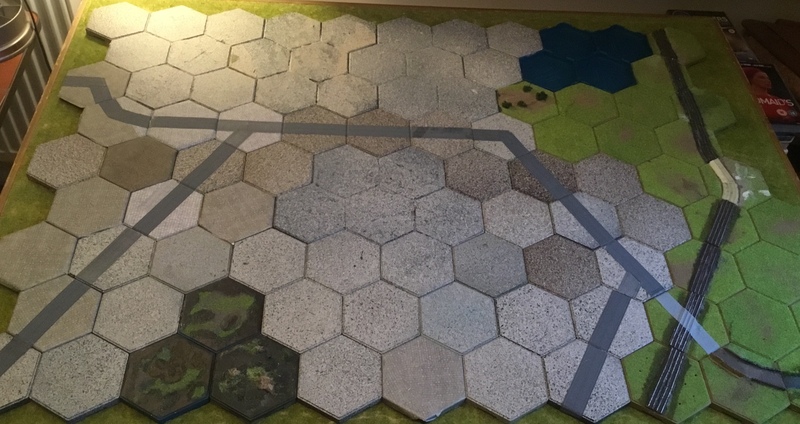 The city hexagons are plain Kallistra tiles, most of which are sprayed with a stone effect aerosol paint. Some are my previous method of covering with printed adhesive paper or vinyl labels. The roads are Noch Z scale self-adhesive cobbled road, except in the country where I generally use painted glass paper cut to fit. They represent the major thoroughfares shown on the master campaign map. When gaming the player can use the city roads for faster movement by sacrificing the protection offered by city areas. Railway lines are from Leven Miniatures, cut and shaped to fit the hexagons. They are made from very brittle resin, so a great deal of swearing goes on during the cutting/shattering process. The three swamp hexagons represent flooded polder. One is a home-made effect, the other two are as bought from Kallistra, but with the blue plastic painted dark muddy blue and covered in diluted PVA glue. All the grey tiles, including the four inverted blue tiles currently sitting in for more stone-painted tiles drying in the shed, must be covered in “6mm” buildings and ruins. All of the green area to the right of the railway will be heavily wooded. While writing I noticed two more tiles are needed at the far right side of the board.